For SLPs preparing to work with children who have autism spectrum disorders, selecting effective interventions for communication and social challenges is critically important. This accessible textbook gives SLPs the in-depth knowledge they need to evaluate, choose, and apply today's best interventions for communication and social interactions. 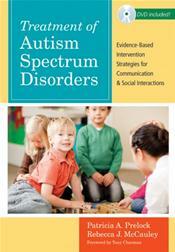 ... To help readers find the information they need and compare interventions easily, each chapter clearly lays out key details on each intervention's theoretical and empirical basis, practical requirements, components, applications for both children and adults, and considerations for children from diverse cultural and linguistic backgrounds. Brief, illustrative video clips and case studies show the interventions in action, and helpful learning activities prepare SLPs to make sound decisions in scenarios they're likely to encounter in the field. With this practical, expertly organized textbook, tomorrow's SLPs will expertly choose and apply interventions that improve the communication and social skills of people with autism spectrum disorders.